Looking for a gearstick support that can keep up with the most intense racing games? Playseat® presents the GearShiftHolder PRO for the sim racers that demand only the best and require gear that's ready for the most extreme and exciting races! The Playseat® GearShiftHolder PRO is compatible with all gear shifters on the market, highly adjustable and usable both right and left of the chair. The accessory is compatible with the following racing seats: Playseat® Evolution, Playseat® Revolution, Playseat® Project CARS, Playseat® Gran Turismo, Playseat® Forza Motorsport, Playseat® WRC, Playseat® Forza 4, Playseat® Air Force, Playseat® Champion and Playseat® SV. Great accessoire for the playseat. Very easy to mount. And give you more fun to play your game. And looks great. For me nothing else than Playseat. I like this shifter mount. It's sturdy steel with high quality hardware. It's very simple and straight forward to install and has a lot of adjustability. If international shipping charges were more affordable, I'm sure it would be more popular in the us. This is the best add on you can buy for the playseat! Shifting is so much more fun " obviously need the shifter as well" i have the G29 wheel and shifter. The quality is really great! Nice and solid, best yet the quick shipping! Bought a playseat Evolution Alcantara, slider and gearshift holder pro. Several large boxes and many pieces of steel, bolts, screws and manuals arrived! Very well manufactured materials - fit and finish was excellent, all threads were well made etc. It was quite a challenge to build the seat, gearshift and slider all in one go as they had to be built in parallel. However, the manuals are clear and if you take your time and give yourself room to lay everything out neatly it is not that difficukt. Assembled it is extremely comfortable, good looking and compact. All in all a very smart addition to my gaming system. This is very sturdy. It's in a good position and can be moved around a little for adjustment. I would like an option to have it raised higher for sequential shifting. I have had my GearShiftHolder PRO for about two weeks now and using it has been great fun. The shipping was fast and it came carefully packed. Its assembly and integration with the Playseat was pretty easy. The materials and quality of construction are astonishing which make the gear shifter usage extremely sturdy. Although before buying the GearShiftHolder PRO I had some doubts about if it would be worth, now I have no doubts at all. I am very happy with it. The gaming experience is incredibly immersive; I fully recommend it! I was originally planning on building a shifter mount myself, thinking how hard could it be to get some steel and bend it myself? Well, to buy steel with a proper thickness can be quite expensive, and to bend it can be quite complicated. I thought of a couple other solutions but none of them would turn out to be sturdy enough. I started researching shifter mounts and the only three I could find was the Openwheeler shifter mount, the older generation Playseat shifter mount, and this Pro model. The Openwheeler looked like it might have worked but reviews said it was wobbly by design (despite being cheaper). The older version Playseat shifter mount was about the same price as this yet less adjustable. And, finally the Pro model, sturdy, highly adjustable, and works very well. If you need a shifter mount, this is the only option you should consider. I also recommend buying from the Playseatstore directly since it was cheaper after shipping and tax when compared to U.S. based online stores. The gearshift holder is a must have if you have a manual gear shifter. It just adds that extra bit of realism to your experience and it can be mounted on either side of the seat which is useful. It can also support virtually any gear shifter which means you have no worries wondering if your shifter will fit in or not. The shifter was also packaged with the seat that I ordered and they both arrived very quickly. The gearshift holder has a lovely painted finish and altogether the whole seat assembly looks amazing. If you are building a racing sim you should have a shifter. If you have a shifter you want a place to mount it. Simple as that. It's nice and sturdy and sits in the right place. Lots of adjustment to fine tune positioning. Pretty sturdy, easy to assemble. Purchased my playseat evolution a month or two ago and was going to wait to get the gearshift holder but finally got my hands on a shifter and immediately grabbed it. The time it took for me to get it was outstanding it was only a few days ever order that I got it which is crazy since it was coming from overseas. The assembly has to be one of the easiest assemblies I’ve ever done once it lined up with my seat I got all the nuts and bolts on the right area and tighten it down With an Allen wrench and I put my cement together connected the shifter and the thing won’t budge which I extremely like. I’ve been racing this one tire week since put it together and I can’t believe it took me this long to get it this item has to be one of the best items I’ve ever purchased and it’s very helpful towards my same racing career this is money well worth spent I highly recommend if you have a place to eat you need to get the shifter holder! Works perfect along with the Playseat. well built quality and sturdy. give it a 4 on design, as it should be able to mount without taking the sides/seat all apart again. 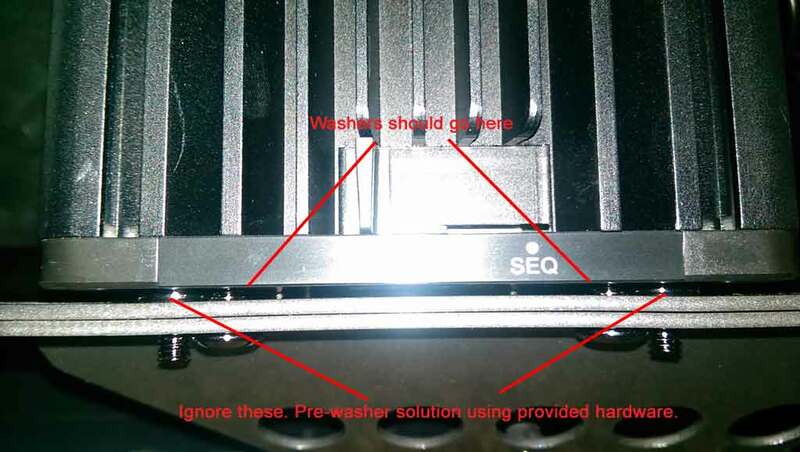 Otherwise it looks like it will function well. I like this shifter mount. Very good product quality. Easy to install and come with manual! I ordered Playseat Gear Shift Holder as well as Playseat Evolution and I am very satisfied. I put on my gear lever and it's very fun. I drive like a champion. I am delighted with this purchase and I recommend it to anyone who still hesitates. This is a must have if you have a shifter! Fit very well with my logitech shifter. Many thanks playseatstore. Website Very serious, 5 star service, quick answers to my questions. I recommend buying this site without any doubt. After years of sitting behind my desk my backache is gone using the playseat. I can finally run long stints again in iRacing. I took the whole package... and i'm loving it! Had to fiddle a bit with distances of wheel and pedals. But after a little bit of fiddling everything seems to fit perfect. I bought this to go with my playseat. Design is good, could be more rigid. Putting together a doddle following a youtube video by simproject. Fully adjustable, price okay...but think it should come with the seat even if it ups the price of the seat. A great addition to my play-seat Alcantara. I purchased this as a part of my Project Cars 2 seat order. Once I pulled it out of the box, I was very impressed by the build quality and the attention to detail with the items construction. My big concern was that it was going to move around and flex from being mounted, but as I was assembling it, I realized how much bracing they actually put on the mounting for the gear shift holder. It was very impressive. I took it for a spin and was very impressed with how rigid the whole gearshift setup was! If you are going to buy a Playseat DON'T skip out on one of these if you intend on driving manual with a clutch! I bought this to mount my Thrustmaster TH8A shifter and it worked like a champ! Installation was easy enough and allowed for just enough adjustment to cater to my liking. Very sturdy when tightened down, don't worry about the shifter moving when you're grinding through gears. I love this gearshift holder and I recommend it to anyone with a playseat and a shifter from Fanatec, Thrustmaster, or Logitech. This is a must have to create the real experience. Crazy not to buy this accessory. This is the closest feeling to the real thing! I purchased the Gear ShiftHolder Pro for my new playseat and I must say it takes the racing the experience to another level. The shifter holder met all my expectations. It is very steady and strong and mounted my Logitech G920 shifter perfectly. I found that with this addition, I am placing higher than the other racers that use automatic. The BEST reason why I wanted this product was to teach my son how to drive using a manual shift and this I found was the most realest way to accomplish that. We are both having so much FUN as well, thanks Playseat! This works beautifully, it is stable and well made. Thanks!!! I have 2 cockpits from playseat. I bought this shifter holder for my Revolution. The only thing i suggest is create a white color. I purchased my Playseat Evolution a couple of years ago and it gets quite a workout from me! This product is stable and I am more than satisfied with the comfort for long races and the stability it offers me. Just upgraded to the Logitech G920 with the shifter, so I added the Pro Shift Mount and just like the Evolution Delivery, it arrived sooner than expected, was simple to install on the seat and is the icing on the cake for my Racing Rig! Great job Playseat, you get a thumbs up from me! I have an older model of the Playseat Evolution that I've enjoyed for years (since the PS3 came out). From my Logitech DF:GT, to the G27, then on to the PS4 and the T80, T150 and now T300, it's served me well. As the sim "games" became more realistic, so too did my racing equipment and my expectations of it. The TH8A is a great shifter, but it is difficult to solidly mount to your rig. The Playseat Gearshift Holder Pro took care of that concern. It fits perfectly onto my Evolution sim rig, and puts the TH8A exactly where I need it. After hours of use (and abuse rowing thru the gears in DiRT Rally), it has held up to everything I could throw at it and never failed. If you are looking to take your sim racing to new levels of realism, the Playseat Gearshift Holder Pro is a MUST HAVE accessory! This is a must have it you want the full sim experience. It allows a ton of adjustability to get the shifter in the perfect position for comfort and use. Highly recommended but just make sure to put it on the seat as you assemble the seat initially. Some of the screws did require a bit more force to tighten. When assembled it excelled as easy to adjust and very steady. Excellent, it makes the sim racing experience much better, it is fully adjustable to fit anyone's personal preference. Mounted on a Logitech Driving Force Shifter for G29 it fits perfect. A must have for anyone who want to recreate a real driving experience. Adds a great touch for the shifter. Facile a monté et je suis content de résultat ! Excellent purchase! It makes the sim racing experience so much better with the shifter in the correct position and it is fully adjustable to fit anyone's personal preference. It's is bolted under the seatable and at the bottom where the cross brace is and makes for a very sturdy mount. Well worth the money! This is a must if you own a steering wheel with a 6speed shifter. I have the G29 and it fits perfectly and looks great. I purchased the gearshift holder pro for an older model Playseat SV, and was glad to see that everything fit perfectly. The gearshift holder pro is a very sturdy design and powder coated in an attractive gloss dark grey. Installation was a little tricky due to the weight of the playseat, but access holes in the gearshift holder pro panels made fastening and adjusting much easier. There is excellent adjustability and drivers of all sizes should be able to mount a shifter in their ideal position. I was delighted to see that specific instructions for most major shifter models (Logitech, Fanatec & Thrustmaster) were included. Overall a great purchase, very highly recommended. Bought this along with the gaming chair, and the seat slider, installation was a bit tedious as you will have to give it a thought before you start installing all parts together.. I ended up disassembling the seat, to fit the gear holder and seat slider in and reassemble the seat back together.. but in general, everything turns out well and all good.. enjoying every minute of it.. thanks!! First let me say that the customer service I encountered was outstanding. My email was answered in an expedited manner which helped me to make a decision and complete my purchase. I received my gear shifter pro extremely fast given that my order was international. Nice to know that your order is really cared for and shipped out expeditiously .Once received and installed I can say that the gear shifter pro has been excellent addition to my play seat rig and has added enjoyment and realism to my console racing experience. products are well made and well worth the value. Looking forward to my next purchase in the near future. Thanks again Playseat for an outstanding experience! Very nice gadget . Dont use it all the time but it is nice to have . I have been using the standard shift mount with a Logitech G27 for a few years now and have been very happy. 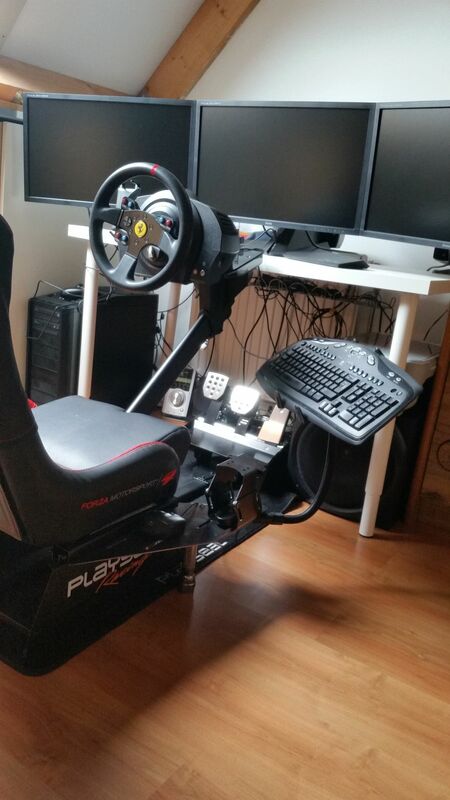 But I recently upgraded to a Fanatec Clubsport setup including the V1.5 SQ shifter. The added weight of the Clubsport shifter combined with the stiffer shift movement was causing more wiggle in the shift mount than I like. I was pleased to see that Playseat offered a factory upgrade mount with the ShiftHolder Pro, and ordered it on the spot. This upgrade was totally worth it. I now have zero wiggle when moving the shifter fore and aft, and only minor wiggle in the left/right direction. The left/right wiggle is not due to flex in the shifter mount, however, but due to minor flex in the seat frame itself. The left/right wiggle was totally unnoticeable while actually racing, but I ended up adding some bracing inside the seat frame myself (mostly because I love to tinker), and now this thing is rock solid. 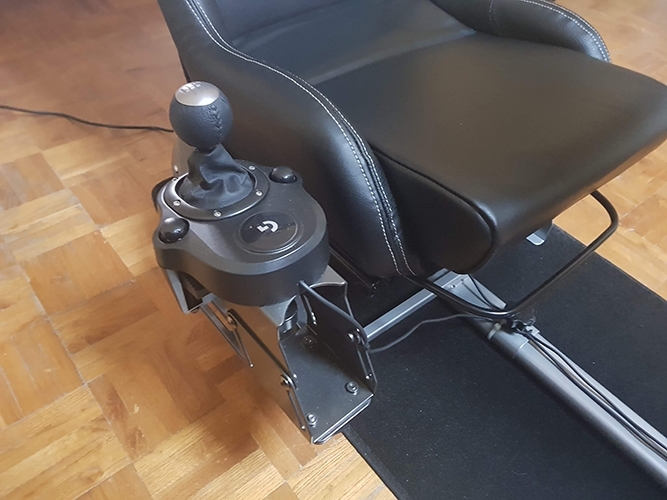 I imagine if I had used the Pro mount with my G27 shifter there would have been no wiggle in any direction, the Fanatec shifter is just a massive beast of a thing. One additional note for Clubsport shifter users. Due to the placement of one of the mounting screws on the frame the shifter won't sit completely flush on the frame. Adding a few washers around the bolts that attach the shifter to the frame (between the shifter and frame) will raise the shifter high enough to clear the bolts in the frame. Not a big deal, something to know. I asked for the seat for a Christmas gift--and asked for the gear shift holder. Unfortunately, "Santa" missed that the gear shift holder didn't come with the seat. It would be better if you could make it more clear that it is sold separately. Especially when you have to half take the seat apart to install it afterward. BUT--first, I would like to say that delivery time was fantastic! (You guys really surprised me, especially with the international shipping--great job!) Once installed, it works great--just like everything else I've gotten from these guys! I saw a review that asked for it to be adjustable. But I've got to say--it's just about where the gear shifter is in both my cars. So I wouldn't need to move it. I'm a happy iRacer! It is perfect as it is, but will be even better if it can be a big higher or can be adjusted to your height and length. Easy to assemble, adds to realism, great fun if you are not so used to using the "controller". Makes and old bloke like me competitive with my 16 yr old son!! This product is a great addition for the playseat! Highly recommended. Was originally unsure whether I needed the GearShiftHolder PRO or not, I am so glad I got it!! Customisable for either left or right hand side, handy for here in Australia. Exceptionally easy to fit to the Playseat and it's easily moved to suit your driving position/comfort. If like I was, you're trying to decide if you need the GearShiftHolder PRO, I'll tell you now it's absolutely worth it!! Fit properly, good quality, works great. Good instructions. Love the look of it. I also love the way it slows no movement, it is tight with no wiggle room. This is a great gear shift holder that works with different kinds of gear shifts.It has several different mounting locations for your preference and is really solid when mounted.I ordered the seat slider with it and they work well together no problems.I would definitely recommend this product if you want to mount your shifter to your playseat. The gear shift holder is a very strong and high quality add on. Very pleased with it. The GearShiftHolder Pro is a great way to add realism and get a more immersive experience when using your Playseat! This is a solid product!!!! It was very easy to install and the adjustability is great you can move the shifter practically wherever you want, I should have bought this along time ago! This is a great product. Its really solid and wonderfully adjustable. Easy to install and takes around 20 minutes. I would highly suggest this add on for anyone who wants an in depth racing simulation experience. I'm using a WRC seat with the Logitech G29, mainly for project cars. Driving is simply a great experience, realistic and it allows to personalize too many things, so you can improve your experience even more. Gear shift holder pro is just awesome, easy to install and looks nice. Highly recommended if you like racing games. Playseatstore.nl is a clicks and bricks, which I prefer over an online-store only. The playseat staff was very helpfull and adviced me well. I bought my playseat set in-store, they send me the items to my home within a day. The Gearshiftholder Pro has a great stability, and is easy to adjust to your preferences. 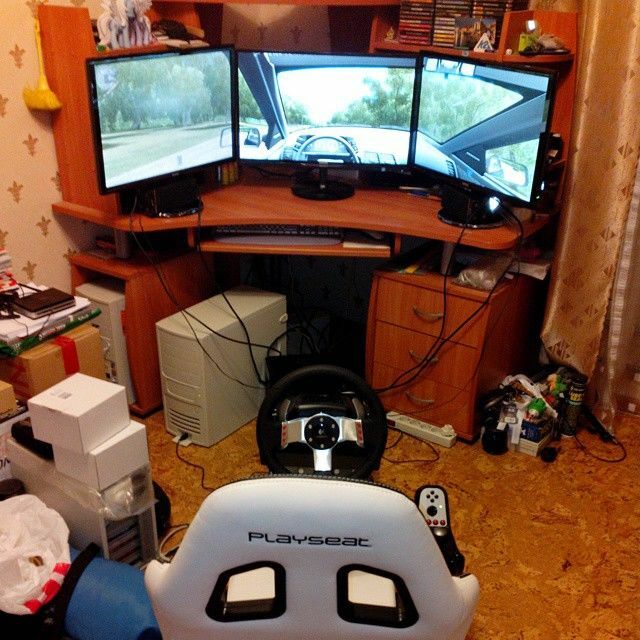 A must-have to increase the fun and realism in sim-racing! Compared to the other shifter mounts offered by Playseat, I would have to say this is the go-to for mounts. Thankfully due to its size and construction, there is room to mount additional accessories. Having room for a handbrake setup for those rally games / drifting was a much appreciated feature! And shipping to Canada was FAST! İt's a must for playseat..You have to but it if you are going to use it with shifter.. This product is great, I wasn't going to do it halfway, I wanted the full virtual experience, and this helps to complete that.!!!! Great product. This thing is solid! My Logitech shifter doesn't move at all, very sturdy construction! Combined with my Gran Turismo seat it is hours of fun! The essential companion to any Playseat, I wish it was included as standard. Well built, easy to install and adjust to your taste, I'm pretty sure you could even fit a handbrake on this! I really like this gear shift holder for my Logitech G27. It's adjustable to position the gear shift at comfortable position and height. Of course, I'm not changing its position whenever I change the car in the game because you have to loose botls, adjust and tighten bolts back. I bought the shifter rack. I don't regret my choice because the original shifter plate seem to be too close to the seat. Ajustable as i wanted it's a good option to add to the seat. With the Playseat® GearShiftHolder PRO the driving experience is the same like in a real car. Very good equipment. All metal gearshift mount that is highly adjustable and no flex at all! Better looking, more solid, and best value of anything I found elsewhere or build myself. This is a really sturdy bit of kit. You just forget it's there, which is just what you want. You can't enjoy your Playseat gaming chair with H-shifter without this one! I was extremely impressed with the quality of this unit. All of the parts were individually wrapped to prevent any damage in shipping. There were no burrs or sharp edges on any of the parts and everything had a high quality powder coating on it. Even the screws and bolts had a shiny finish on them. The design was very well thought out and everything fit together perfectly. I am still waiting for some other components to arrive before I can start using the unit but, I see no reason to think that it will not perform flawlessly. After receiving and assembling many other items over the last 40 years, the quality of this GearShiftHolder Pro was a refreshing change.